Posted by admin in activity reports, eruptions, Gaua, Pacific, Vanuatu. Gaua volcano, Vanuatu: a MODIS image from the NASA Terra satellite, 12 April 2010 (source: NASA Earth Observatory, 15 April 2010). 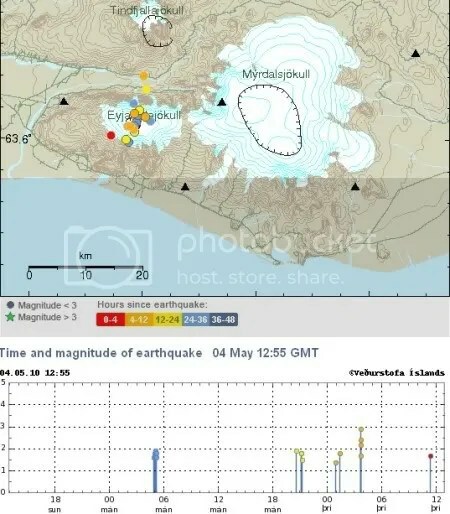 Gaua volcano in northern Vanuatu has been showing signs of increased activity for some months: in November 2009 there were evacuations of villagers from Gaua island because of ashfall and gas emissions. During January 2010 ash emissions became denser and darker, and gas emissions increased. Strombolian activity and explosions were reported at the end of January. From late March into April ash plumes were reported daily, reaching altitudes of up to 3 km, and reports of explosions, ash fall and the ejection of volcanic bombs continued. The Mount Garet cone of Gaua volcano erupting on 14 February 2010, captured by the Advanced Land Imager aboard NASA’s Earth Observing-1 satellite. 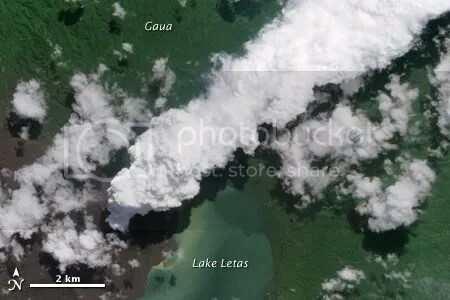 The crescent-shaped body of water is Lake Letas, which partially fills the Gaua caldera (source: NASA Earth Observatory, 18 February 2010). Today news sources are reporting that extensive evacuations are being planned, involving the transfer of about 2700 people from Gaua or Santa Maria Island to a relocation centre on nearby Vanualava Island. 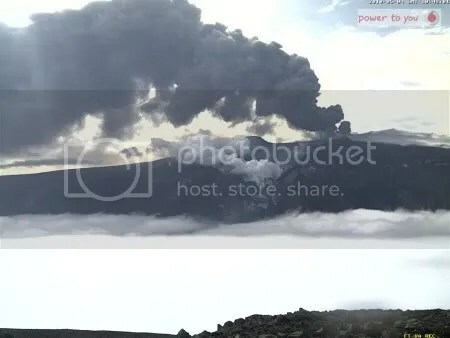 According to Peter Korisa of the Vanuatu Government emergencies office the volcano’s activity is not stable, but increasing: ‘Last year it was just some explosions and some ash falling but at the moment the activity is becoming more interesting’. The evacuation is not yet being carried out, but the necessary plans have been made. At the moment, Korisa says, ‘the situation doesn’t warrant any evacuation’, but the authorities are ready to act should such a step prove necessary. The alert level for Gaua remains at its habitual level 2, according to the Vanuatu Geohazards Observatory. UPDATE 20 April 2010. A reader has correctly pointed out that the previous headline for this post, ‘Evacuations in Vanuatu as Gaua activity steps up’, gave the impression that the evacuations are already under way. This is not the case, the evacuations are only at the planning stage, and I have changed the headline to reflect the situation accurately. Thanks, TJ, for the correction. The cloud of volcanic ash is now spread across the UK and continuing to travel south. In line with international civil aviation policy, no flights other than agreed emergencies are currently permitted in UK controlled airspace. 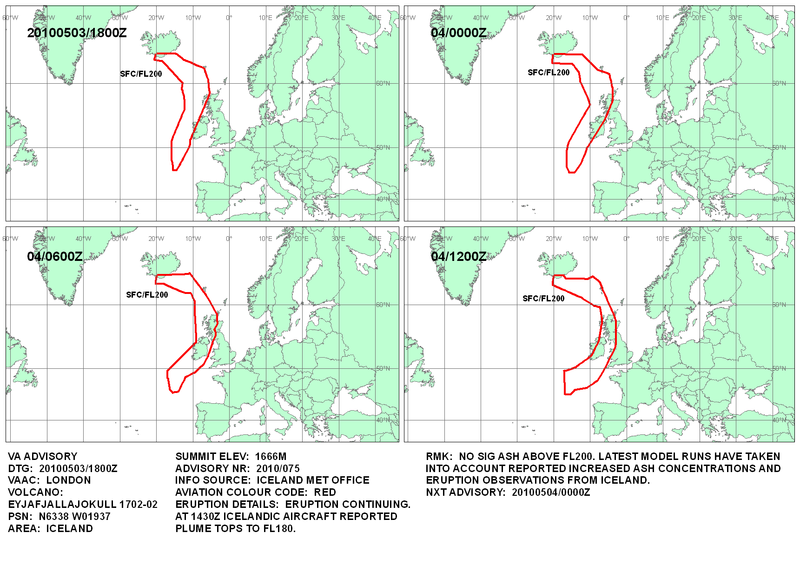 Following a review of the latest Met Office information, NATS advises that these restrictions will remain in place in UK controlled airspace until 0700 (UK time) tomorrow, Friday 16 April, at the earliest. We will review further Met Office information and at 2000 today (UK time) we will advise the arrangements that will be in place through to 1300 (UK time) tomorrow. 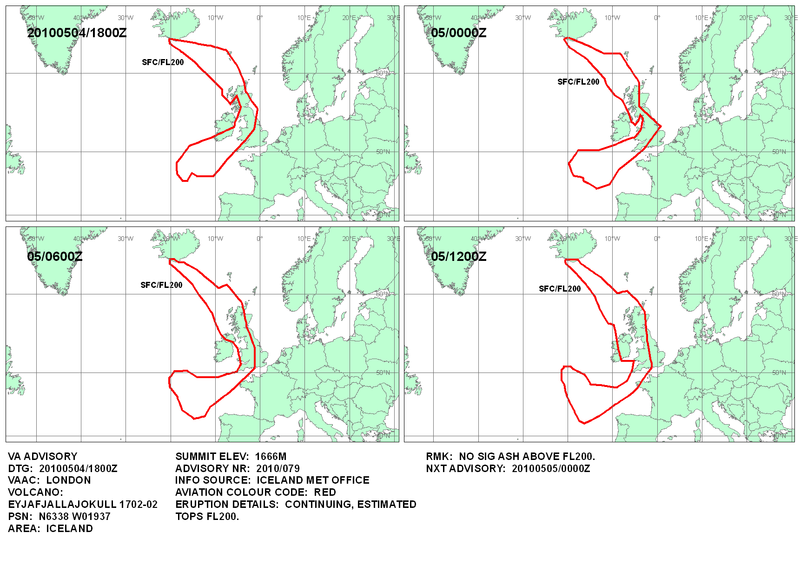 As well as the total closure of UK airspace, the ash emissions from the Icelandic eruption are causing extensive disruption across the north Atlantic and northern Europe. 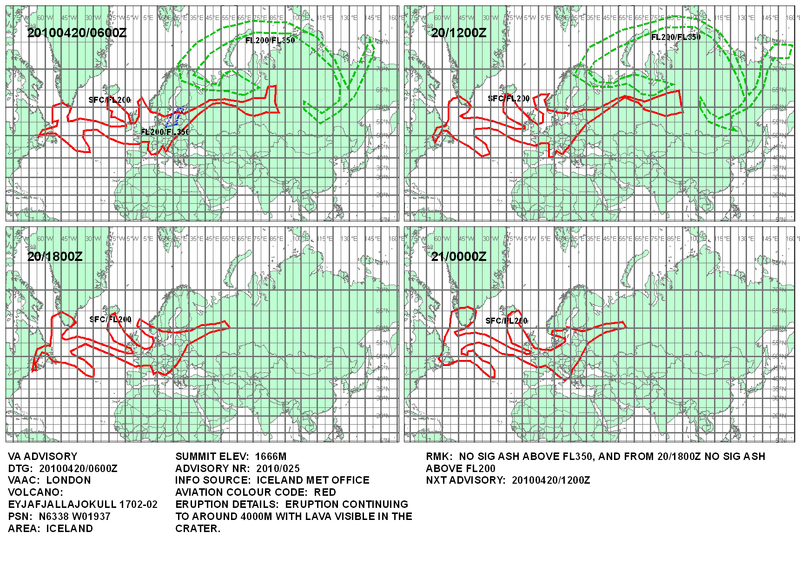 The BBC has detailed and up-to-date coverage, and Dr Klemetti has more volcanological insights at the Eruptions blog: Threat of Icelandic ash closes airspace over Europe. Also, there is news that volcanic ash is arriving in small quantities at ground level in the Shetlands and northern Scotland.